These best latex mattress reviews 2019 should help you if you need a new mattress – or even if you don’t! In fact, you may need a new mattress but you don’t like spring mattresses or memory foam. So what’s available? Latex mattresses have been becoming increasingly more popular. Why? Here’s why: bounce with a comfortable and healthy sleep. If you want bounce, you can get that with a latex bed. Perhaps not quite as good a bounce as an innerspring mattress, but certainly good enough for your needs! Comfort? No issues! Nothing to dig into your ribs as can happen with spring mattresses. Healthy? Definitely! 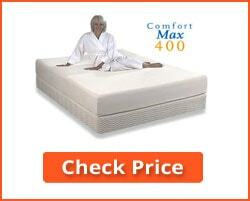 You only have to read a few latex mattress reviews to find out that this is a healthy way to sleep. Keep Cool? A latex bed does not overheat you as memory foam can do. Bounce? A latex foam mattress is pretty good for bed-time games – kids or adult games! So which to buy? Here are my best latex mattress reviews 2019 to help you choose the latex foam mattress most suited to your needs. I shall first review the 10 best latex mattresses I can find, and then provide you with a Buyer’s Guide to help you understand the benefits of latex mattresses and what to look for when buying one. I have investigated and checkout out the various latex mattress brands and models available, and come up the following ten that I believe best taking several factors into consideration. Value for money was one, but so too were comfort, weight, thickness, health issues and other factors that people should consider when choosing a mattress. Here are my ten best latex mattresses for 2019. The size chosen for the review was Queen size to ensure a true comparison is made. * Mattress types are explained in detail below, in the Buyer’s Guide. ** Layers exclude textile cover. NOTE: ‘Weight’ refers to the weight of the mattress once unpacked and lying on the bed. This is not stated when the manufacturer has not provided it. This is a Talalay latex foam, fitted with a bamboo knit zippered mattress cover. 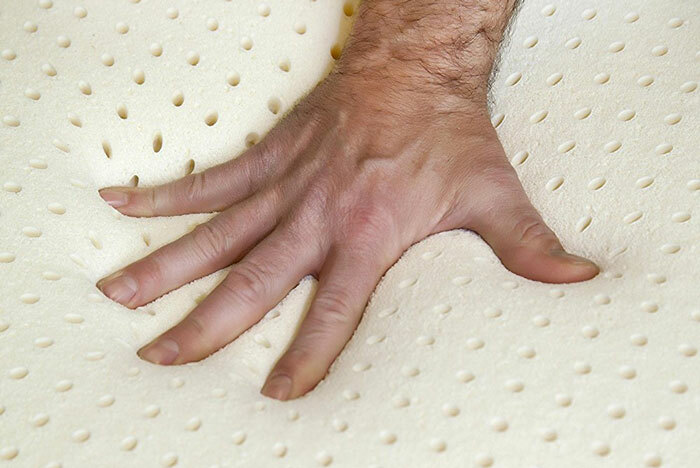 It is a 100% latex mattress that consists of 6” an initial 36 ILD core of Talalay latex foam (ILD details – see Buyer’s guide) – the higher ILD the harder the foam. Over the core is a 3” comfort layer of Talalay latex. The core can be changed at purchase for softer 32 ILD Talalay latex, or with Dunlop latex if you prefer. You can also discuss the best comfort level for you by calling the number provided when ordering and ‘Ask Chuck’ – the form’s Sleep Agent. If it is still not to your liking once you receive it, you can return the mattress for the hardness of the comfort layer to be changed for a fee. The total thickness of the finished product is round 10”. Organic wool achieves fire-resistance without the use of chemicals. Hypoallergenic, antimicrobial and resistant to dust mites. Hardness/firmness tailored to your needs – Ask Chuck facility. Very few: One person commented on hotness when sleeping. Editor’s Notes: The ability to adjust the hardness or firmness of the mattress to your requirement is a major benefit of this mattress. It provides the benefits of the softer Talalay latex foam that offers better cushioning than the harder Dunlop latex. The Dreamfoam Elements Latex Magnolia Latex mattress is an excellent choice for those who are allergic to dust mites and for those that prefer the mattress to be made in the USA. My Green Mattress is a handcrafted with 6” of 100% natural Dunlop latex with a medium firm ILD of 32. This is a one-sided mattress than cannot be flipped – but can be turned/rotated. The sleeping side is topped with soft cotton, quilted with natural wool for maximum comfort. The bottom side is covered by a non-slip cotton/polyester (<1% polyester) blend that holds the mattress firmly to the base. The total height of the mattress is 7”. This mattress is best laid on a flat solid or slatted base – a box spring base is not recommended. After purchase, you have a 100 night trial period. 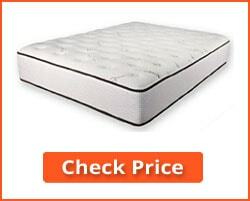 If you are not happy with your mattress during this period you can return it for a $99 return shipping fee. 100% reviews give 4-5 stars. GREENGUARD Gold certified: this indicates the mattress has particularly low chemical (VOC) emissions. One-sided: Cannot be flipped but can be rotated. Editor’s Notes: If you are looking for a 100% latex mattress, then this is an excellent choice. Being made using Dunlop latex, it does not have the soft feel of a Talalay latex mattress. If offers good support, and conforms to your body shape without the confined feeling of a memory foam mattress. 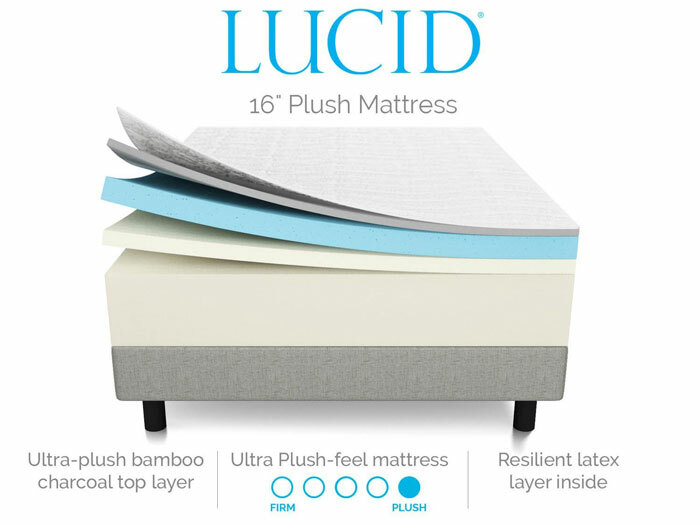 The Lucid Plush 16-inch latex mattress comprises four layers for maximum comfort. I considered placing this top of my ‘best latex mattress reviews 2019’ list, but decided to place two 100% latex mattresses in the top positions. This mattress contains a memory foam layer on top to provide pressure relief on the pressure points, particularly the shoulders, hips and knees, for those who need it. The top layer comprises 1” of bamboo memory foam which lies over a 3” gel memory foam layer to keep you cool. The gel is distributed in tiny capsules throughout the foam to collect and dissipate your body heat while sleeping. Beneath that is 2” layer of softer natural latex, and finally 10 inches of high density support foam for maximum support. Together, these layers provide excellent orthopedic support and reduce pressure on your neck, back, hips and shoulders. The memory foam used is fashioned with an open cell structure which prevents your body impressions from become ‘set’ into the mattress. Benefits of both natural latex foam and memory foam. Soft Tinsel wood cellulose/polyester cover that creates a layer of breathable air at the top of the mattress. Antimicrobial, with natural resistance to allergens and dust mites. CertiPUR-US certified foam to contain no CFCs, phthalates and low VOC emissions for indoor air quality. Excellent sleeping surface for orthopedic use where neck, shoulder or hip support is required. Of the 12% 1-2 star reviewed, many complaints were about it being too firm or too soft. May be due to personal perception of the softness or hardness of the mattress. Most loved it. Editor’s Notes: This is a very comfortable mattress combining the benefits of natural latex and memory foam , and is ideal for those requiring a level of orthopedic support. It is said to be environmentally safe for you and your family. At over one-hundredweight (52 Kg), its weight is likely the only genuine negative aspect of this mattress. This Ultimate Dreams mattress is placed at #4 in the list of my ‘Best Latex Mattress Reviews 2019’ because it is a good lower-budget Ultimate Dream mattress. The top sleeping surface is biodegradable quilted bamboo cover containing 1.5 inches of super-soft hyperflex foam – a polyfoam intended to give a softer sleeping surface without the ‘push-back’ effect of firmer latex foams. This mattress is topped with a 1.5-inch layer of this quilted polyfoam in the bamboo cover. Next, under the quilted layer, is 3-inches of Talalay latex foam as the main sleeping layer, and finally a 6-inch base layer of high-density 1.5 lb antibacterial Talalay latex foam. You can customize the firmness of the mattress using the comfort level list provided when ordering from the link above. You can choose from one of four comfort levels from firm to ultra-plush. Alternatively, you can call the number provided to ‘Ask Chuck’ – the firm’s #1 Sleep Agent who will advise you. Customizable firmness levels – Ask Chuck facility. The main issue with the 13% 1-2 star reviews related to the lifetime of the mattress. The mattress may sag after several months use. However, the vast majority were happy with their purchase. Editor’s Notes: This is an excellent choice of mattress for those who require a customized support level. Many people may like the concept of a specific mattress, but find the regular sleeping surface too soft or too hard. With the DreamFoam Cushion Firm mattress, you get to select your own hardness level from options provided. Alternatively, you can call the manufacturer in the USA to discuss the best construction to meet your needs. The term ‘bariatric’ refers to those of larger sizes or obesity, and the provision of supplies or items relating to people of such proportions. When used in relation to mattresses, bariatric means that the mattress in question is suitable for people of large proportions and weight. A bariatric mattress is designed to offer such people comfort while in bed. The Comfort Sleep Overweight Bariatric Mattress has been specifically designed support people with a body weight of 300 – 400 pounds (approx. 140- 200 KG). It is also suitable for people who prefer a firm bed. The mattresses are made to order and you can call the company using a phone number provided on the Amazon page to have the mattress designed specifically to your needs. The main support layers consist of 5 inches of 36 ILD Talalay latex foam. This lies over 5 inches of UltraCell high resiliency foam which provides a buoyant and resilient base that maintains its shape and properties under the highest of stresses and weights. This combination is ideal for the support of large or overweight people. It also has a cotton blend mattress cover. 100% 5-star reviews from those who use it. Mattress designed specifically for large, heavy people. Made to order and customized to suit your weight and sleeping position. Manufactured using the best type of latex foam for support and resilience – meaning it supports you and also reverts to its original shape when your weight is taken from it. 30-day trial period, during which the mattress can be customized to your needs. Only the one: this mattress is not available in the following states: CA, CT and RI. Editor’s Notes: If you are particularly heavy, overweight or obese, and you find your current mattress uncomfortable or unable to support your weight, then this is probably the best mattress for you. It is made in the USA, and can be customized for your weight and sleeping habits. If you are particularly large then this mattress is worth a try. It is manufactured using a layer of Talalay latex foam for comfort and second layer of resilient foam designed to support your weight. Each layer is customized specifically for you. A 1-inch layer of Talalay latex infused with graphite. The graphite is conductive, and absorbs your body heat while sleeping. A 1-inch layer of swirl gel memory foam which not only offers a slight memory foam feeling, but also works to further to keep the mattress cool while you sleep. A 1-inch layer of VISCO memory foam to support your body shape while you sleep. A 7-inch support layer of latex foam. This is a high-density latex which helps to isolate you from any motion disturbance in the mattress shape while you sleep. The mattress also has a washable cover that can be unzipped and washed in the case of accidents. It is easy to remove, wash and replace. He Cushy Beds 4-Layer mattress provides good support, incorporating the memory foam experience and benefits should you want them. 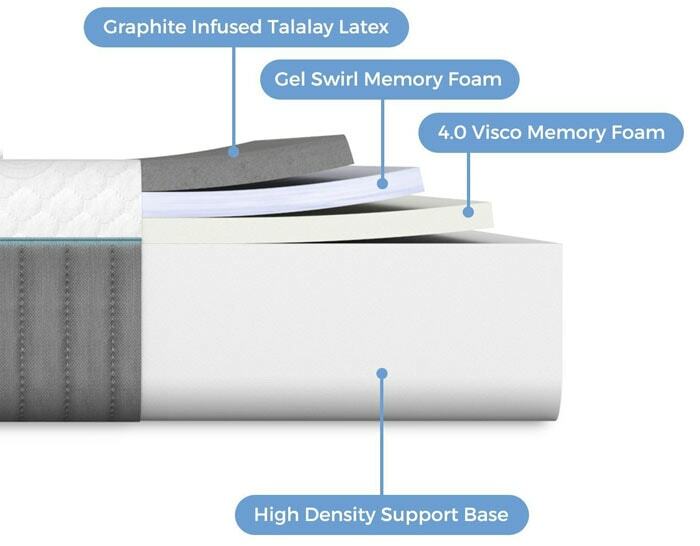 Allows you to sleep cool with the Talalay latex that is infused with heat-absorbing carbon, and also the gel memory foam layer that also absorbs heat. The four layers combine to provide a marvelous sleeping experience that just one layer could never offer. This mattress combines cooling, memory foam and comfort with the level of bounce that helps with bedtime activities. Some do not like a multi-layer mattress. Editor’s Notes: This mattress has not appeared in the top 3 of my ‘Best Latex Mattress Reviews 2019’ because it is 50% memory foam in terms of layers – with a latex foam base and a 1” latex foam top layer. It is also relatively new, with little time yet for problems to arise. However, it looks really good for general mattress use for you and your children. The Roma Natural Latex Mattress by Sleep EZ is a 9” mattress that consists of 6” of Dunlop Latex that is quilted both sides with 1.5” of CertiPUR foam. The mattress is encased a layer of fire-protective rayon made from cellulose extracted from bamboo and stretch knit material spun from cotton. Each side of the mattress is different. One is plush and soft for side sleepers, and the other side is harder for stomach and back sleepers. In this respect, it is not truly flappable but both sides can be used according to your needs. The Roma Natural Latex mattress is non-toxic and also antimicrobial, hypo allergenic and is suitable for you and your children to sleep on. 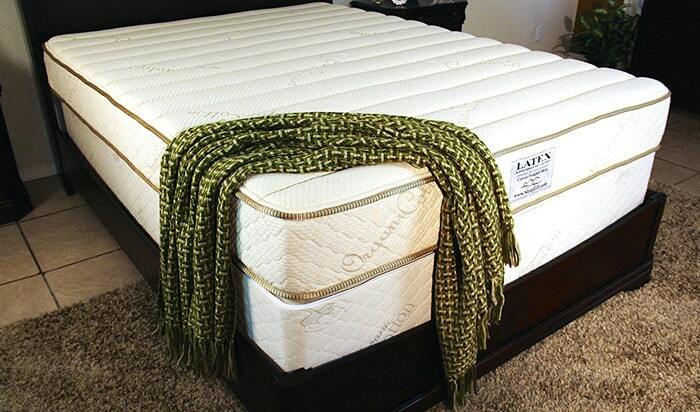 5 inches of CertiPUR-US foam each side of the mattress, where the cover also provides a fire-resistant barrier. Antibacterial, hypoallergenic and resistant to molds, bedbugs and dust mites. Different comfort levels each side of the mattress. Made in USA (Phoenix AZ). Not genuinely flippable because each side is of different hardness. 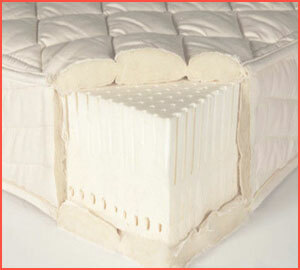 This 11-inch thick mattress has been constructed using 100% natural latex with fabric encased coils. Until now I have been discussing only natural, Dunlop or Talalay latex mattresses. Now I am introducing what I consider to be the best combination of latex and innerspring: the Eco Terra Luxury Latex mattress that I believe to be awesome! So why? Because it has been constructed using fabric encased coils and latex with no off-gassing and no other health risks. You don’t get the feeling like you are sleeping in quicksand, as many do with memory foam. You still get the isolation from your sleeping partner that is associated with memory foam. 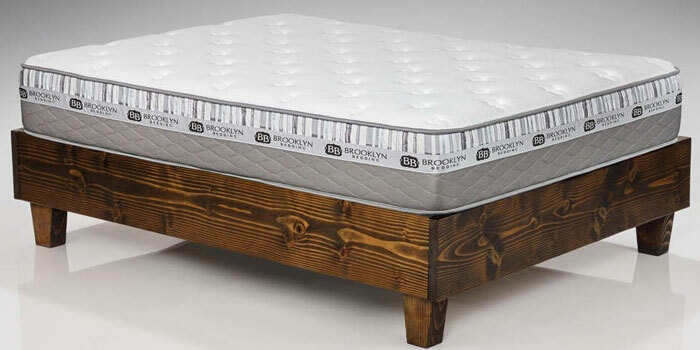 100% Natural latex provides a good sleeping platform, with natural buoyancy and support for your pressure points. Suits most people with a medium firmness rating, and the individually pocketed springs enable a reasonable isolation of the movement of you partner. There are no additives used in its manufacture, and no off-gassing associated with other types of foam. The pocketed coils keep your spine in its natural shape while you sleep. Very few, although some cannot get used to a foam enclosed spring mattress. Editor’s Comments: This spring coil mattress is constructed with 100% natural latex used to pad a fabric encased coil spring structure. 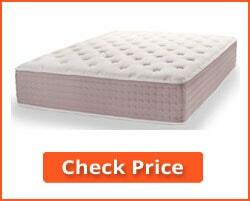 It offers the benefits of both pocketed coil spring mattresses and latex. Good support and bounce, with good isolation so you are not affected much when your partner moves about in bed. The Eco Terra luxury mattress has a thin internal quilt super soft foam backing on the plush side for added comfort. The soft Talalay latex provides a comfortable sleeping surface while the purpose of the harder Dunlop latex is to provide a smooth, comfortable transition from the soft Talalay latex to the harder poly support layer. Latex foam tends not to retain heat, and also reduces motion transfer between partners. It is better than memory foam for bedroom activities, and kids love its ‘bouncability.’ Another benefit of this mattress construction is that it keeps your spine in proper alignment. Promotes cool sleeping – body heat is distributed by the foam structure. Choose your preferred comfort layer. Comfortable, yet offers good support for the spine, neck and pressure points. 120 day trial period – return within 120 days if not satisfied. Very few negatives – make sure you choose the correct comfort level for your needs. One or two people (literally) found the mattress too hard or sagging after a period of use. The Pure Green Natural Latex mattress is the new kid on the block – an impressive one. I may have rated it higher in my best mattress reviews had it had a longer history. This is a well-constructed 3-layer mattress offering excellent comfort and support. The mattress is topped with a quilted organic cotton and New Zealand wool cover which has been designed and manufactured in Chicago. A 1-inch zippered top layer of quilted New Zealand wool and organic cotton. This layer not only provides comfort, but also insulates against your body heat and prevents it from passing into the body of the mattress. A 6-inch layer of 34 ILD Dunlop natural latex foam. This layer offers deep compression support for most sleepers, although if you are particularly large you might want to refer to my #5 listed choice above – the Comfort Sleep Overweight Bariatric mattress. The entire mattress is rated as being of medium hardness, though such ratings are often subjective, depending on the view of the user. Each mattress is hand crafted – hand sewn and put together by expert craftsmen and women in the Chicago plant. Zippered cover for easy removal. Due to its three carefully graded layers, this mattress is suitable for front, side and back sleepers. Dunlop latex foam used is manufactured to the company’s own specifications = more control over foam quality. Made in USA: All sewing and assembly carried out in the Chicago plant. None reported other than one on the degree of softness – which is a subjective opinion. Editor’s Notes: This a new mattress that has been designed and constructed to offer a 100% Dunlop latex mattress – other than the wool and cotton top quilted comfort layer. It is designed to be both comfortable to sleep on and to provide good support for those that need it. It is too soon to make a definitive decision on this mattress, and to give it an accurate comprehensive review. 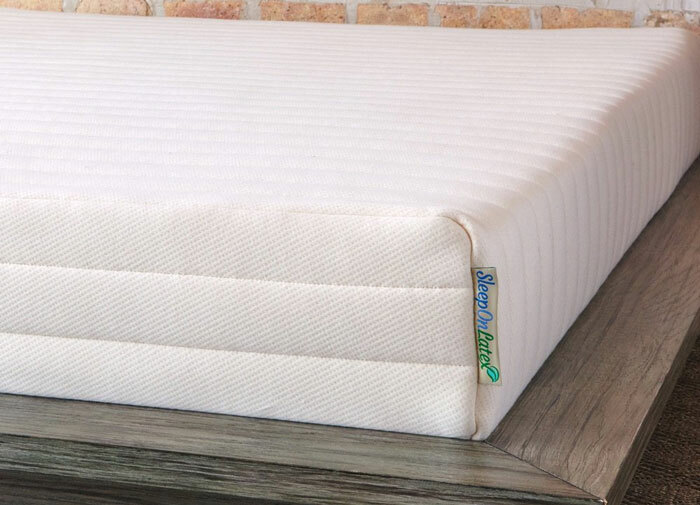 However, it looks good and I am certain that it will take a much higher position in this Best Mattress Reviews 2019 post. What really is the best latex mattress? This Buyer’s Guide will help you to make your own decisions buy providing you with my top 10 latex mattresses. I have included mattresses using latex with layers of memory foam or pocketed springs, although most are exclusively latex. So why specifically latex? What is the difference between latex and memory foam, polyurethane foam or even an innerspring mattress? 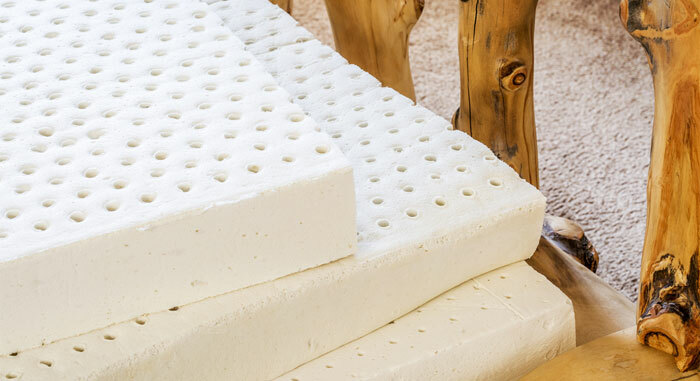 What’s the difference between the various types of latex foam: Natural, Dunlop and Talalay? 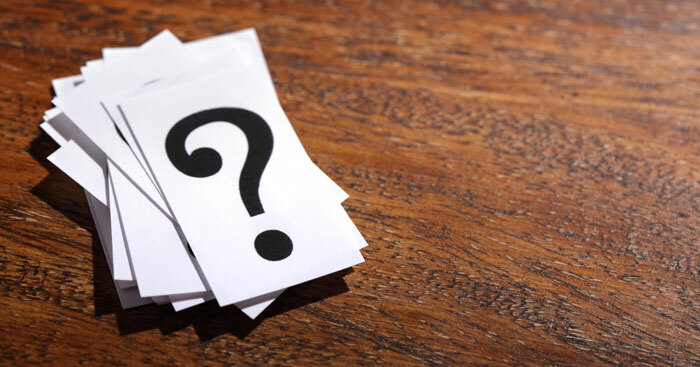 I will answer some of these questions in this guide to enable you to make an informed choice when selecting the best latex mattress to meet your own specific needs. In its raw natural form, latex is a milky fluid that the rubber tree, and other plant forms, use as protection against herbivores that would otherwise eat them. It is tapped by cutting into the tree, then collecting the latex fluid. Water is then removed from the fluid which is then mixed with air to create a foamy consistency that is then coagulated to produce a springy dried foam. There is more than one type of latex used in mattresses. Natural latex is manufactured using the latex produced from rubber tree sap as explained above. This type of latex is fairly expensive, and not generally used in mattresses sold in retail showrooms and outlets. 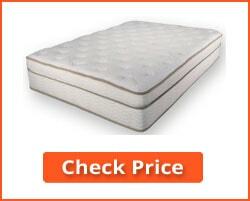 You may find such mattresses for sale online, but they are expensive. Synthetic latex is manufactured using a raw material that can be polymerized to create a latex-like substance. Styrene is one such raw material that is used to create a form of latex foam, but one that has a shorter lifetime, is relative soft but that is also much less expensive than genuine latex. Blended latex is a mixture of natural latex and the synthetic variety. A typical blend could be anything from 20% natural (organic) and 80% synthetic to a 50/50 mix of the two. If you purchase a mattress manufactured using a blended latex, make sure that the specifications states the blend. The price will drop according the increasing relative proportion of the synthetic latex. However, as a buyer, you are more likely to come across terms such as ‘Dunlop’ and ‘Talalay ‘latex. What do these mean? The terms Dunlop and Talalay refer to the manufacturing process used to make the latex foam. The traditional Dunlop process takes the liquid sap extracted from the rubber tree and pours into a mold. It is then baked to create a block of solid latex. This is then allowed to cool and removed from the mold. This technique leads to an inconsistent product, because the sediment from the milky liquid drop to the bottom of the mold as it cools. The result is then a latex where the top is softer then the bottom where the residues have accumulated. The Talalay process starts the same as the Dunlop process, but after the white liquid has been poured into the mold it is sealed and put under vacuum while mixing around and then flash dried before baking. Because this process takes longer than the Dunlop process, Talalay latex is more expensive than Dunlop latex. Much depends on the end use of the latex foam. Dunlop latex is denser and harder than Talalay latex, so is generally used as the base layer of a mattress. Talalay foam is softer due to the air it contains, and is mainly used as the top or ‘plush’ layer of a mattress. You will rarely find a mattress 100% Talalay latex – it will normally have a Dunlop support layer beneath it – or even a polyfoam (polyurethane) layer. You cannot judge which is best – each is different and used for different purposes. When you read how mattresses are constructed, you should be aware that Dunlop latex is firmer than Talalay latex. So if you want a firm mattress, opt for Dunlop foam, or go for Talalay if you prefer a softer sleeping surface. As I have previously stated, a Talalay foam top layer with a Dunlop latex layer below provides a combination of a comfortable cool sleeping surface with a firmer base beneath it to support your weight. When you visit mattress comparison websites, or mattress review sites such as this one, you will probably come across two ways of measuring the hardness of a mattress. These are ILD (Indentation Load Deflection) and foam density. ILD and density use different units of measurement which relate to two different properties of the foam concerned. Here is what each of these terms mean. Foam Density: This is stated in terms of pounds weight. It is a measure of the weight of a foam in terms of pounds per cubic foot. That is, how much a cubic foot of the foam weighs. The greater this figure, the more dense you can expect the foam to be, the more weight it can withstand. The higher the density of a foam, then the higher the weight that foam can hold when used as the base support layer in a mattress. ILD – Indentation Load Deflection: The ILD of a foam relates to how easy or hard it is to compress that foam. This is a better measurement of how well a foam performs in a mattress than just its density. It is generally tested pressing a circular plate of 225 square inches in area onto a 4 inch thick foam, then measuring the weight in pounds needed to compress that foam by 25% (1 inch.) ILD usually ranges from around 14 to around 38. The weight in pounds required to achieve that indentation for a specific foam is known as its ILD number. So for the100% Dunlop latex used for mattress #2 above (Simple Sleep – My Green Mattress) it took 32 pounds of pressure to indent 225 square inches of the latex foam used for that by 25%. The higher the ILD, the denser and more firm the mattress. So how do you choose a latex mattress? What factors should you take into consideration? First, consider your weight! For somebody 180 to 240 pounds, I would suggest trying a mattress with am ILD of 32-35, and perhaps a mattress topper or thinner top layer with an ILD of 22-25. If you are particularly heavy (300 – 400 pounds) you will need a dense latex with a high ILD. If you are unfamiliar with these terms in relation to mattresses, then your best approach is to visit a mattress store and try out a few mattresses. Ask to try mattresses of ILD 35+ with a comfort layer of softer foam. You can take it from there as to whether you go up or down in compressibility or hardness of the foam. Perhaps a higher density would be better for you than higher compressibility – try it and see every time with mattresses! Then purchase online for the best deal. 1. My Memory Foam mattress gets hot when I sleep – does a Latex Foam mattress do the same? No – latex foam does not heat up in the same way as memory foam does. One of the reasons for this is that memory foam conforms to the contours of your body, so more of your warm body is in contact with it. You will sink slightly into a latex foam mattress, but nothing like the same extent as with memory foam. Also, latex contains more air than memory foam, so has a more open structure that absorbs and dissipates heat more effectively. If you prefer a cooler memory foam, go for a gel option. This contains beads of gel which absorb your body heat and keep the mattress cooler. 2. Which is better – a Talalay latex or Dunlop latex? It’s not a question of which is better – it is how you use the mattress that counts. If you want a softer type of latex that offers more comfort and pressure relief on your shoulders, hips and other pressure points, then Talalay latex is preferred. Dunlop latex is firmer and often used as the main core layer of a mattress. Dunlop latex mattresses also keep their shape longer, and are less likely to sag or leave a permanent indentation over time. See the Buyer’s Guide above for more information. 3. Can I use an electric blanket with a latex foam mattress? Yes – so long as the mattress has its cover attached – it is best not to apply heat directly to the foam without a cover. 4. My latex mattress is claimed to be hypoallergenic – what exactly does that mean and should I have a certificate stating this? The word ‘hypoallergenic’ means that the mattress is less likely to cause an allergic reaction than normal. There is no precise medical definition. Information provided by the FDA states: There are no federal standards or definitions that govern the use of the term hypoallergenic. The term hypoallergenic means whatever a particular company wants it to mean. Because there is no specific definition or testing method, there is no certificate. 5. How do I clean my latex mattress – and how often should it be cleaned? NOTE: Check your warranty first. Some warranties are void if you wash the top cover or clean the mattress – refer to the warranty conditions or the seller for information on this. 6. How about dust mites? A latex foam mattress tends to resist dust mites, although it cannot eliminate them completely. You can reduce the chances of dust mites breeding in your bed by opening the cover and vacuuming the mattress all round, using the crevice tool to get into any seams and corners. The same is true for bedbugs. 7. Should I use a mattress protector? This is recommended for most mattresses. 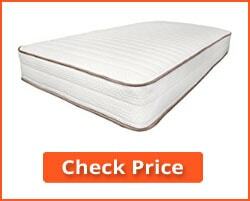 A mattress protector will prevent any accidents (urine, sickness or spillages) getting into the foam. It will also keep out dust mites and bedbugs. 8. How often should I flip and rotate my latex foam mattress? A latex mattress should not have to be flipped or turned over. It can be rotated, so the bottom is now the head, if you want to avoid the possibility of ‘dips’ in the mattress. Such dips are caused by you sleeping in much the same position each time. There are many different types of latex foam mattresses available for you to choose from. My best latex mattress reviews 2019 include a range of different types of latex mattresses offered by a range of manufacturers and vendors. You can use my list and my Buyer’s Guide to help you make the right selection for your needs. My FAQ section may answer some of the questions you have yourself.